Schneeberger machines come in a variety of sizes, shapes and can be used for a whole host of applications – including medical applications. The grinding paths along textures (spirals, slanted lines, etc.) are generated based on a predefined 3D model. The spiral angle, cutting angle and number can be selected freely in the QUINTO software package for medical devices. Each part of the 3D model that is ground is linked to operations in the program. The tooth depth is calculated based on the surface curvature. All teeth for the hip rasp are ground in one clamping. As with hip rasps, the grinding paths along textures are generated based on a predefined 3D model. The number of paths, gap and direction can be selected freely in the QUINTO software package for medical devices. Each part of the 3D model that is ground is linked to operations in the program. The grinding paths can be adjusted to the shape of the edges. The entire knee prosthesis is ground in one clamping. Automatic machine loading and deburring the completed prosthesis are available options on both the above. The tip geometry of biopsy needles is available in a wide range of shapes. Oscillating grinding is carried out to prevent burr formation. In order to keep the grinding disc as sharp as possible, truing is carried out at regular intervals in the process. An automatic loading and unloading system is, of course, available. Bone blades for surgical use are available in numerous variants and sizes. The teeth are ground from CBN or ceramic using a V-shaped grinding disc. The teeth can be arranged in a straight line or offset; the blade’s shape can be straight or curved. Depending on the machine, various automatic loading systems can be offered. Dental drills for orthodontics are available in many variants. One common feature is the standardised shaft with Ø 2.35 mm. Profile shapes are read into Schneeberger’s QUINTO software as dxf files. Production is fully automatic thanks to the use of a loading and unloading system, cyclical truing for the discs and integration of an automatic lunette. gemini NGM: large grinding volume in a compact machine with efficient automation. The possible configurations range from high-powered flute grinding to profiling of hobs with high-frequency relief grinding. Generous axis travel doesn’t just cover the workpiece dimensions but also allows plenty of space to include processes such as dressing, measuring and loader access. Remarkable features of the gemini NGM are power, mechanical and thermal stability and absolute precision. The dynamically relevant axes can be configured with linear motors, supporting oscillating processes or, the rapid changeover of auto loading or dressing processes rendering the work effortless. 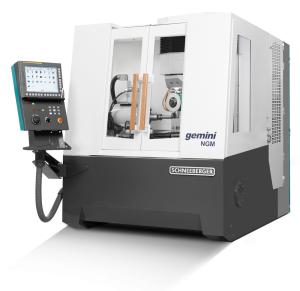 Thanks to its compact machine design, the high-performance gemini NGM is also highly efficient. The robot compartment is located very close to the tool holder. Tools are changed reaching through the rapid collapsing doors in seconds. The loader space can be conveniently observed from the outside. The swivelling control console allows accessibility to make loading or creating production jobs easier all around. The wheel magazine for 8- 14- or 24-wheel packages with wheels of up to 250 mm (10″) in diameter offers absolutely no limit for designing complex grinding processes. 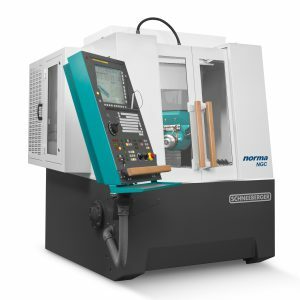 normaNGC: universal and super compact new generation of grinding machines. Modern Drive Dynamic and Precision meet a carefully laid out and balanced machine design ideally suited for the broad challenges of tool grinding. The axes are based on a single, solid cast iron part which guarantees mechanical and thermal stability. The completely new machine concept was realised with well-known and classic designs, protecting all essential components from grinding swarf. Schneeberger’s acclaimed machine reliability and uptime well once again be proven, even surpassed. The norma NGC is a super flexible 5-axis tool grinder suited for sharpening and production. It offers the complete package, including end grinding up to 300 mm (12″) cutting length, 300 mm (12″) diameter and maximum length overall of 500 mm (20″). The high torque water cooled direct spindle offers stability, designed to flute grind from solid. Thanks to perfect TIR, high surface finishes, highest precision for intricate geometries can be expected. Standard tools such as end mills, ball nose end mills, high performance drills, reamers, profile tooling, profile insertable tools from carbide to Cermet. For the sharpening of hobs, shaper cutters, stick blades specifically designed clamping systems as well as programs and processes are available. Production grinding of knifes for the paper, food or plastic industry is all possible. Slitting discs can be automatically loaded and clamped.